Yesterday, something completely unexpected happened in my otherwise pretty sedate and habitual life. 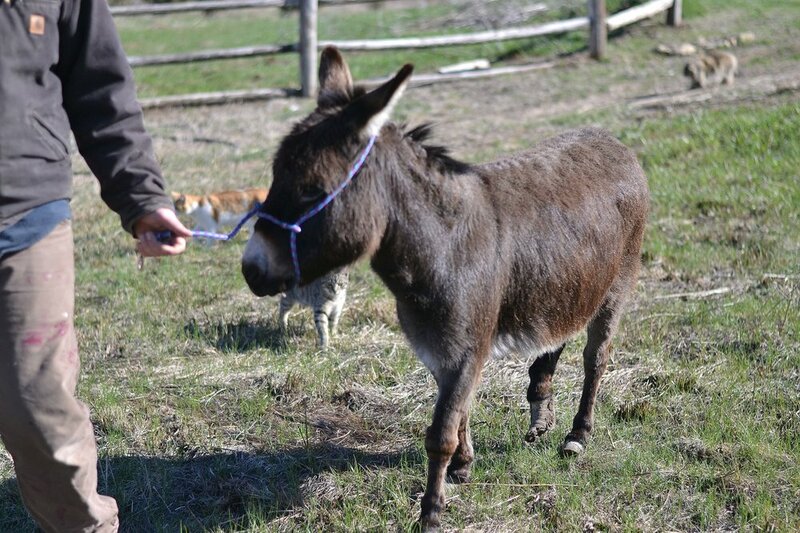 We adopted a donkey. We weren’t actively looking to add any animals to our family here. Honestly, we felt we had reached the number we could comfortably support. I know talking about money isn’t considered in good taste by some, but for us, finances are something we think about a lot. We choose to live on Dave’s single salary. (He’s a high school science teacher.) Sometimes, okay a lot of the time, this feels a little restrictive. I’ve had a lot of people remark over the years (probably without a lot of thought), “Oh, you’re lucky you can do that.” Meaning I’m lucky - we’re lucky- I can stay home with Nettie. But the truth is that it isn’t about luck or being really financially well off. It’s mainly about deciding that we’re going to try to make things work on less. That we don’t go on vacations. Or buy new clothes, or drive new cars. We don’t eat at restaurants. We don’t do a lot of the things most people do. And for the most part, avoiding those things has meant we can make it on Dave’s salary. Over the past few years, we’ve felt more and more called to begin taking in animals. The idea of a sanctuary is something that was in the back of our minds six years ago when we moved the house and outbuildings in, but we thought we would have to wait until our finances allowed it. Somehow, though, animals started coming onto our radar that needed our help. Cue the goats, and the chickens. And the five kittens last fall. And now the donkey. She was living just a few miles away, with a family who didn’t have enough for her to eat, and wasn’t able to take care of her feet. Her feet are in terrible shape. It just makes me sick to see them - we’re scrambling today to find a farrier who can help her immediately. I’ve always had a big place in my heart for animals. It’s what ultimately led me to become plant-based in my diet more than five years ago. Dave feels the same way. And I suppose, living out here on this land and having the outbuildings around …. it was probably inevitable that we begin to fill them up. We live in a rural, agricultural area. We’re surrounded by animals who aren’t being cared for in the way they deserve to be. So we took a little leap of faith yesterday, and I’m trying to trust that we will find a way to provide our new friend the care she needs. I think we’re going to call her Gertrude. Gertie or Gert for short. She’s a sweet little thing. I know many of you love animals the way I do. And I even know a few of you have a special soft spot for donkeys. I’d like to try to raise some money to help offset the expenses for Gertie’s feet, and I’m planning on creating some donkey paintings or other donkey-themed art to sell. If you are interested in purchasing something to help support Gertie, please leave a comment here or send me an email or contact me through direct messages on Instagram. As always, I appreciate your support and encouragement more than I can say. After my needle felting frenzy at the end of last year, January 2018 brought significant change to the direction of my creativity. I gave up needle felting in order to bring that creative part of my life more into alignment with my vegan lifestyle, and began trying new mediums, such as paper clay and paper mache. I also began writing the story of a pig named Daisy, a flying pig. That’s her in the photo above. I thought, when I started, that her story would be a picture book, but once I got going, there seemed to be a lot more there. So many fun characters emerged. Neurotic roosters. Clairvoyant nanny goats. I enjoyed writing this manuscript more than anything else I’ve ever done. I’ve also been diving into the world of illustration. Getting lost in a detailed pen and ink drawing or watercolor for several hours is my idea of heaven. As I’ve mentioned before, the best way to stay in touch with me and see what I’m working on is through Instagram. It’s my happy place.